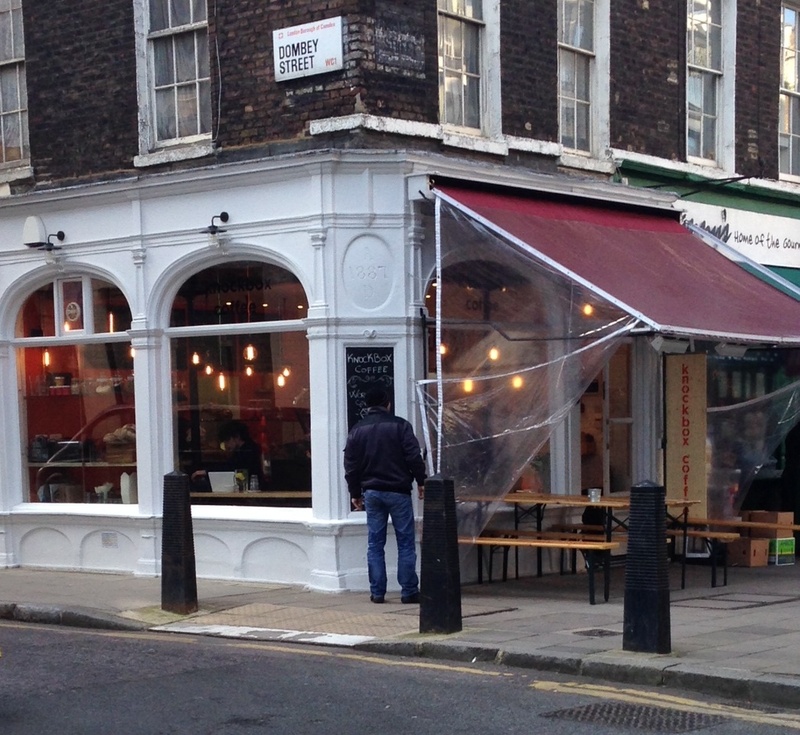 Knockbox coffee is on the corner of Lamb’s Conduit Street and Dombey Street. It is a small place and we had to go twice in order to get a seat, though the compensation is that there are views all around the cafe (it being on a corner). I enjoyed a very good americano, made using Workshop coffee. Complementary jugs of mint infused water were dotted around the cafe which is always a nice touch. Sadly, I tried Knockbox just after lunch and so didn’t try any of the edibles on offer. This does mean however that I will just have to go back to try them at some point (and of course, to enjoy another coffee). There were a lot of things to notice around Knockbox that day. There were the air bubbles in the water that had become stuck around the mint leaves. There were the light bulbs (that you can see through the windows in the picture). And there was the espresso machine: A gleaming piece of machinery that sat majestically on the counter. Looking at the espresso machine it was impossible not to be struck by the reflections from the surface. 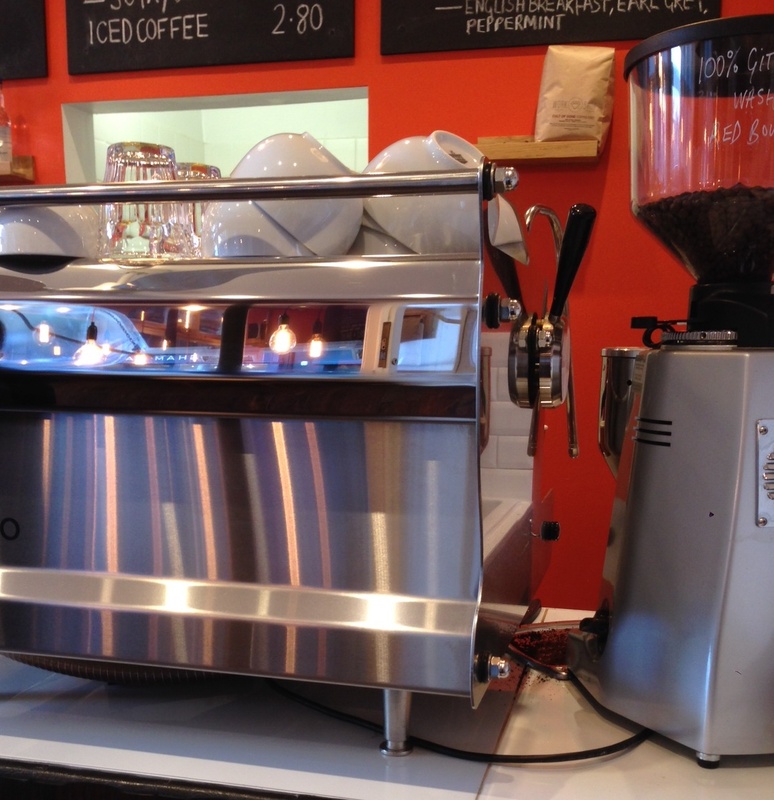 The reflections are not only testament to how much the staff at Knockbox must polish the machine; how reflections work is the subject of today’s Daily Grind. The interaction of materials with light is one of those fascinating areas that reveal physics at its most fundamental. I’ve often taught undergraduate physics students who are looking forward to learning about quantum mechanics because it is “weird”. This is true, quantum mechanics can be quirky, but electromagnetism (which is about light) can be just as odd. To get such elegant and surprising physics out of what is essentially all classical, nineteenth century theory, is one of those joys about learning about (and teaching, using and experiencing) this subject. However, to return to the espresso machine and light. How light interacts with objects reveals how the electrons are distributed in the material which in turn tells you something about the atoms that make up the espresso machine. (For how to experience electrons in your coffee, see Bending Coffee, Daily Grind, 26 Nov. 2014). As the electrons are electrically charged, they respond to light which is, ultimately, an oscillation of electric (and magnetic) field. Electrons in a metal are shared in an “electron sea” between all the atoms in the metal. Consequently, when light falls on a metal surface, the electrons can respond to the electric field oscillation of the light and they re-emit the light backwards as a reflection. Sugar rotates linearly polarised light. 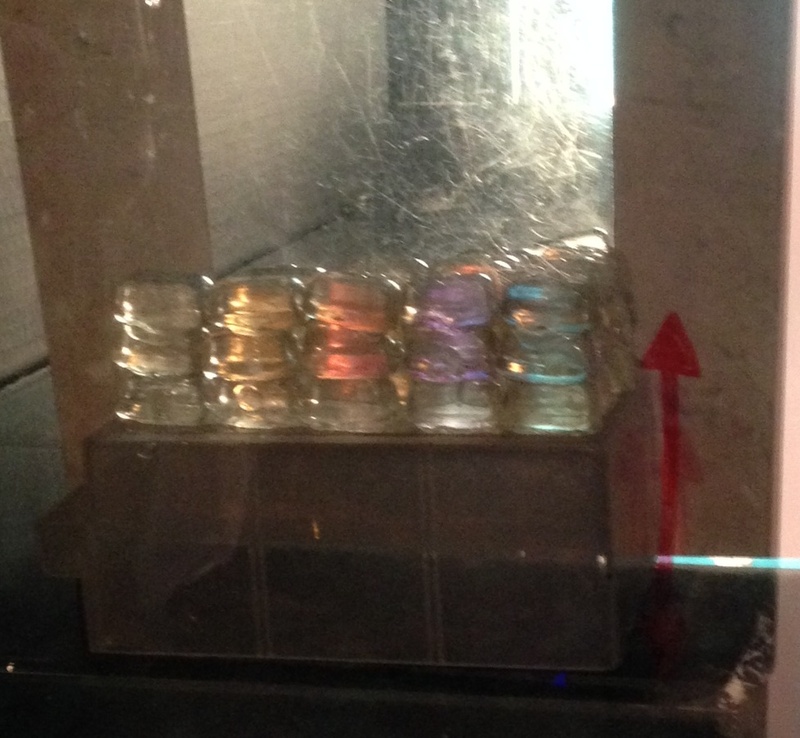 The ‘device’ above is made from layers of Fox’s Glacier Mints and 2 linear polarisers (eg. a pair of polarised sunglasses). Photographed at ‘Lit Up’, an Imperial Fringe event held at Imperial College London, that was free to the public. On the other hand the electrons in the atoms of the plastic of the grinder (or the glasses on the top of the espresso machine) are held firmly to each atom. Therefore most of the light that we see will go straight through these substances with each atom acting to propagate the light forward but not able to completely block it for a reflection. Coffee beans too contain electrons that are held in place by the atoms in the molecules that make up the bean. Unlike the glass though, the electrons in coffee beans are held in atomic bonds that happen to have an “excitation energy” that is at a visible light frequency. Rather than let the light through, they absorb certain colours of light (more info in the Daily Grind here). The result is the opaque, deep brown of the coffee bean. This year is the international year of light, a year which is intended to celebrate our understanding of light. There are so many light based processes occurring all around us at every moment. Why not stop in a cafe and see how many you can spot in your coffee cup?